Abigail has grown. As has Asher. When I first started to record their antics, they were much the same size as our Jack Russell/Pomeranian mix, Buster. I hadn't realized just how much they had grown until I saw them together today. Abby easily stands a good few inches taller than Buster, now. She can also be extremely LOUD. I coerced Kristen to bringing me a goat kid to snuggle after she got home from the school house, but Abby was having none of that. Instead, she followed Buster around causing him to worry and fret. She even took an inquisitive nibble from his tail, which sent him retreating to higher ground. Not much success, that, since Abigail is quite capable of following him onto couch or chair and did. I may not have gotten much in the way of cuddling this afternoon, but their playtime made me smile. Contrast her size from playing with Meaghan on April 6th to today in this video clip: Click HERE for Link. Just like human babies, they sure fill out fast, leaving us to wonder, "Where did the time go? The kids are just over 3 weeks now. They are still nursing from their Mom regularly. Additionally, they nibble some on Momma Ellie's grain and they nibble on the hay stack and other vegetation in the field. It won't be long before the kids will completely graduate from nursing. There are other changes in our kids. We had hoped that they would also be naturally "polled" like their Dam, but like their Sire, they both have horns forming. We choose not to disbud our kids. It is a personal choice and one that means that we will not be able to "show" these kids since the standard is horn removal. We like the look of the goats with their natural horns. Horns also serve as cooling mechanisms, functioning much like an automobile radiator on a hot day. They can be used in their defense against predators. (Realistically, if a wild dog wants to kill a goat, they probably will. I see no reason to make it easy for the predator, however.) Horns are attached to and are part of a goat's skull and carry an extensive blood supply veined through them. Sean and I had to remove a horn from Rachel when she had somehow, during her day, broken it and had it hanging bloody from her head. It bled, as head wounds will, horrifically. It was quite unpleasant to us to have to use heavy shears to sever it and then, cleanse the open wound. It has healed since and seems to be regrowing. Even with this experience, I would rather carefully vet any medical necessity, rather than subject every kid born to us with pain, however brief. On the other side of the argument, goats horns can be dangerous to them and to their humans, even accidentally. Another consideration is that they can get caught in fencing or other items and the horns can break. Broken horns can lead to the possibility of infection or tetanus. Even weighing these concerns, our family does not currently disbud or dehorn our goats. 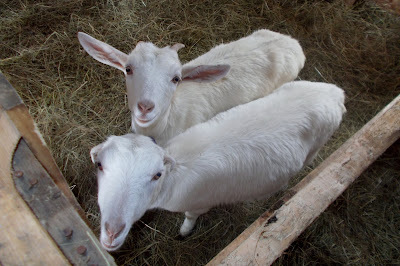 It is our opinion that removing a goat's horns or disbudding kids is unnecessarily painful and has the propensity to cause more problems with scurs or partial horns still forming (Very often these are loosely attached and need to be trimmed or clipped.) We feel that removing a working part of an animal's body because of what could happen is no different than removing a cat's claws to protect our furniture. We chose not to. Instead, we are very careful around those goats that have horn and we teach our children how to handle the goats properly to minimize any risk for injury. We understand that any animal, domestic or wild, no matter how friendly a pet seems- is an animal, not a reasoning human and they behave true to their animal natures. Abigail has gotten big! She is so cute checking out her canine bro.